The Union Public Service Commission has released the Combined Medical Service Exam 2019 Notification on the official website to fill up the vacant posts. There are a total of various vacancies in the recruitment. Candidates can apply from 10th April 2019 to Combined Medical Service Vacancy. This recruitment is for the designation i.e. Medical Officer. Candidates should read our full report to check eligibility and other valuable information on it. The aspirant who wants to attempt in the recruitment should be aware of the last date. It is the best central opportunity for Medical student to boost their medical career. UPSC Combined Medical Service Exams 2019 post also offers promotions at later stages of experience. The candidate should visit this website i.e. upsconline.nic.in in order to apply for the form. The next thing you do is click on this link: Online Application Form for various examination. It will redirect you to the link where we can start filling the UPSC CMS Recruitment Application Form 2019. Enter your Personal Details like name, email id, Address, etc. Now Education Qualification Details and uploads required certificate. Enter your reserve Category details and upload the certificate supporting it. Enter the Id Proof detail (Any). Now upload the scanned photo (not more than 40 kb), Signature (not more than 20kb) and thumb impressions. Now move to the payment portal. You can pay fees by cash in SBI offline or online mode by Net Banking, Credit Card/ Debit Card. Once you have done with payment. Cross verify every detail before you submit the form. After submitting UPSC CMS Recruitment Application Form 2019, take a print out of the form for future reference. The aspirant should have an MBBS degree. Candidates should have passed the degree with minimum 50%. The aspirant who has not completed their rotating compulsory Internship may apply, but she will be appointed after she completes the pending internship. The Candidates who are appearing in the final exam may also apply. The aspirant should have not exceeded the upper age limit i.e. 32 years. He should be born on earlier than 1st August 1986. The Age Relaxation is given to reserved categories. Make the strategy to execute the study plan. Cover the entire syllabus, which will make you feel confident. Focused and Determined toward your study. Practice more by writing, which will help you to remember things for long. Build your speed and accuracy. Take 5 Minutes break as a stress buster. Keep calm, Eat And drink healthy. The candidates can take help from the exam pattern, syllabus and Preparation Tips and start their preparation so that they can qualify the exam with a good score. If you want to get the admit cards for the exam earliest possible keep following jobs.chekr.com. 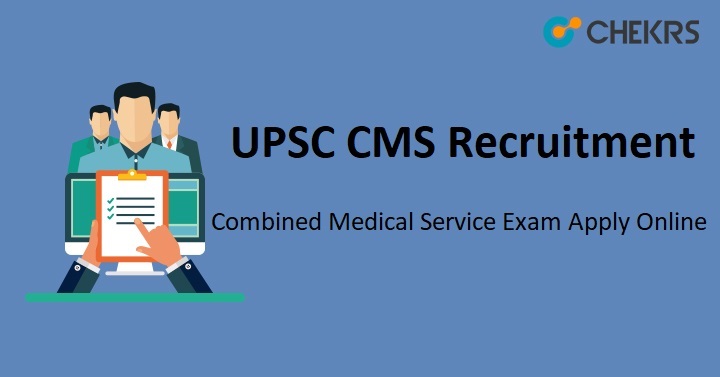 Also, write your problem about UPSC CMS Recruitment 2019 in the comment box to get it solved.